Professional 3 hour tour guide service for small and large groups providing best sightseeing experience in Los Angeles, Hollywood and Beverly Hills. Explore what Entertainment Capital of the World has to offer. 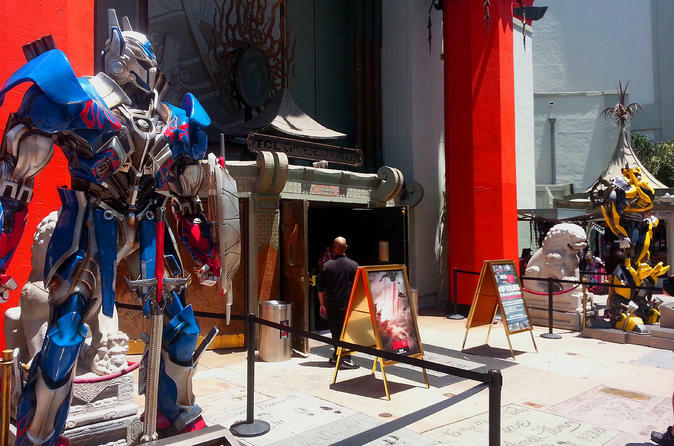 Stroll through famous Hollywood Walk of Fame and take pictures with your favorite celebrity star. Drive by Hollywood Rock Walk and famous nightclubs and restaurants on Sunset Strip. 3 hour combination driving and walking tour. Our local professional tour guide will meet your bus at the designated date behind Madam Tussauds Museum bus parking in Hollywood. - Right away our tour guide will take travelers on the walking tour to see world famous Hollywood Sign, visit Hollywood and Highland Entertainment Center, walk on the Hollywood Walk of Fame, visit main entrance to the Dolby Theater (home of the Oscar Awards), TCL Chinese Theater with hand and foot prints of the famous movie stars. - Then group will rejoin the bus and start driving along Sunset Strip to see Hollywood Rock Walk, celebrity famed nigh clubs and restaurants on to Beverly Hills with the stop by Beverly Gardens Park with the Big Beverly Hills Sign. Group with the tour guide will walk to the sign to take pictures. Then our tour guide will show famous Rodeo Drive with the most expensive stores in the world. - After that the group will rejoin the bus and comeback to Hollywood. During the tour our guide will provide sightseeing commentary about history, popular culture, recent developments in the LA LA Land - Land of Dreams. Please allow us to create a memorable experience in LA for your group.